Sit, stand or work anywhere in between. 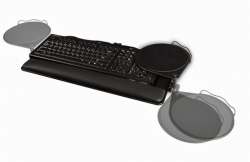 The spring-assisted Cobra™ keyboard mechanism needs no adjustment knobs or levers to change keyboard height; simply lift the keyboard to its desired position and release. The Merlin Mouse makes it possible for a mouse user to micro adjust every conceivable aspect of mouse positioning which is so critical to personal comfort and safety. This produces an infinitely customizable mousing solution that results in the lowest-stress and lowest-risk mousing postures.